Should there be limits on spending in campaigns and elections? And how does this affect your life? There should be limits on how much money individuals can spend on elections. The BCRA’s restrictions on advertisements regarding Citizens United’s film "Hillary" do not violate the First Amendment. The First Amendment protects the right to free speech, despite the speaker’s corporate identity. No. No. Yes. Yes. The Supreme Court overruled Austin v. Michigan Chamber of Commerce and portions of McConnell v. FEC. (In the prior cases, the Court had held that political speech may be banned based on the speaker's corporate identity.) By a 5-to-4 vote along ideological lines, the majority held that under the First Amendment corporate funding of independent political broadcasts in candidate elections cannot be limited. Justice Anthony M. Kennedy wrote for the majority joined by Chief Justice John G. Roberts and Justices Antonin G. Scalia, Samuel A. Alito, and Clarence Thomas. Justice John Paul Stevens dissented, joined by Justices Ruth Bader Ginsburg, Stephen G. Breyer, and Sonia Sotamayor. The majority maintained that political speech is indispensable to a democracy, which is no less true because the speech comes from a corporation. The majority also held that the BCRA's disclosure requirements as applied to The Movie were constitutional, reasoning that disclosure is justified by a "governmental interest" in providing the "electorate with information" about election-related spending resources. The Court also upheld the disclosure requirements for political advertising sponsors and it upheld the ban on direct contributions to candidates from corporations and unions. In a separate concurring opinion, Chief Justice Roberts, joined by Justice Alito, emphasized the care with which the Court handles constitutional issues and its attempts to avoid constitutional issues when at all possible. Here, the Court had no narrower grounds upon which to rule, except to handle the First Amendment issues embodied within the case. Justice Scalia also wrote a separate concurring opinion, joined by Justices Alito and Thomas in part, criticizing Justice Stevens' understanding of the Framer's view towards corporations. Justice Stevens argued that corporations are not members of society and that there are compelling governmental interests to curb corporations' ability to spend money during local and national elections. Is teacher-led prayer allowed in public school classrooms? Should teacher-led prayer be allowed in public school classrooms? Take our School Prayer Survey! As you learn about Engel v. Vitale fill in this Landmark Court Cases Matrix. Take our May They Do that? quiz and learn the limits of the separation between church and state. Learn about the Freedom Of/From Religion Clauses. And tonight only, it's learn one/get one free! Read a little background on the case. And watch this fantabulous video about Freedom of Religion. Check out the facts of the case. The Board of Regents for the State of New York authorized a short, voluntary prayer for recitation at the start of each school day. This was an attempt to defuse the politically potent issue by taking it out of the hands of local communities. The blandest of invocations read as follows: "Almighty God, we acknowledge our dependence upon Thee, and beg Thy blessings upon us, our teachers, and our country." And think about how you would answer the question before the court. 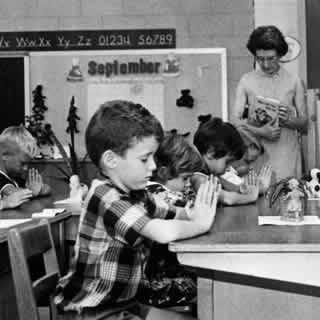 Does the reading of a nondenominational prayer at the start of the school day violate the "establishment of religion" clause of the First Amendment? Listen to audio recordings of oral arguments from Engel v. Vitale. Yes. Neither the prayer's nondenominational character nor its voluntary character saves it from unconstitutionality. By providing the prayer, New York officially approved religion. This was the first in a series of cases in which the Court used the establishment clause to eliminate religious activities of all sorts, which had traditionally been a part of public ceremonies. Despite the passage of time, the decision is still unpopular with a majority of Americans. Complete our class starter on Freedom of/from Religion in American schools, and be prepared to share your answers in class. Think about how the Engel v. Vitale ruling impacted American schools and participate in our freedom of/from religion cases scavenger hunt! Here are some important Supreme Court cases related to Engel v. Vitale and the Establishment Clause of the First Amendment. Providing bus rides to parochial school students is constitutional. The School Board of Iwing Township allowed its buses to transport children to a Catholic school. The Supreme Court rejected an Establishment Clause challenge to this practice, and held that the School Board was merely providing a financial benefit to the children and their parents, and was in no way promoting religious beliefs that are associated with the parochial school. School-sponsored Bible reading before class is unconstitutional. A Pennsylvania law required that each school day open with the Pledge of Allegiance and a reading from the Bible. The law permitted students to absent themselves from this activity if they found it objectionable. Citing Engel, the Court held that school-sponsored Bible reading constituted government endorsement of a particular religion, and thus violated the Establishment Clause of the First Amendment. Public schools may not prohibit student religious groups from meeting on school grounds after hours. Westside School District prevented a student religious club from meeting on its property after hours, citing First Amendment concerns. The club argued that the school's action violated their Free Exercise rights and the federal Equal Access Act. The Equal Access Act was passed by Congress to ensure that any school receiving federal funds could not prevent religious and other groups from using school property after hours. 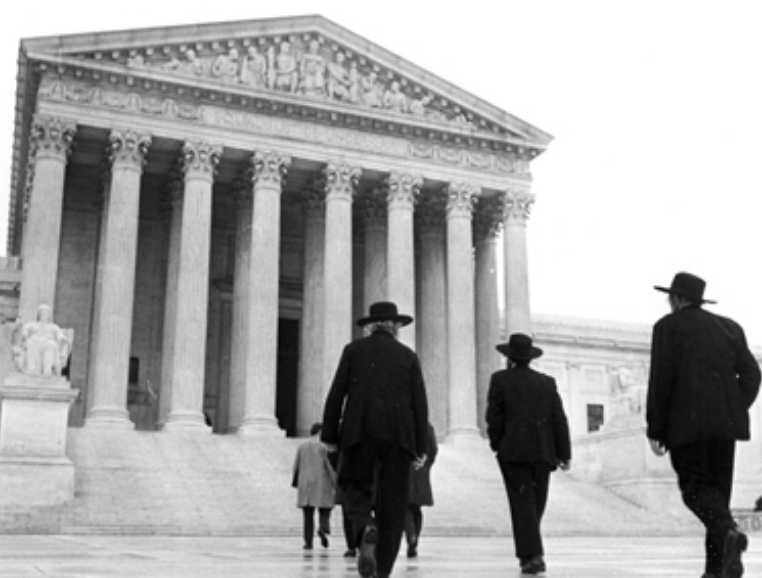 The Supreme Court upheld the Equal Access Act against an Establishment Clause challenge, saying that "neutrality" and no "hostility" to religion is all that is required by the First Amendment. Students may not use a school's loudspeaker system to offer student-led, student-initiated prayer. Before football games, members of the student body of a Texas high school elected one of their classmates to address the players and spectators. These addresses were conducted over the school's loudspeakers and usually involved a prayer. Attendance at these events was voluntary. Three students sued the school arguing that the prayers violated the Establishment Clause of the First Amendment. 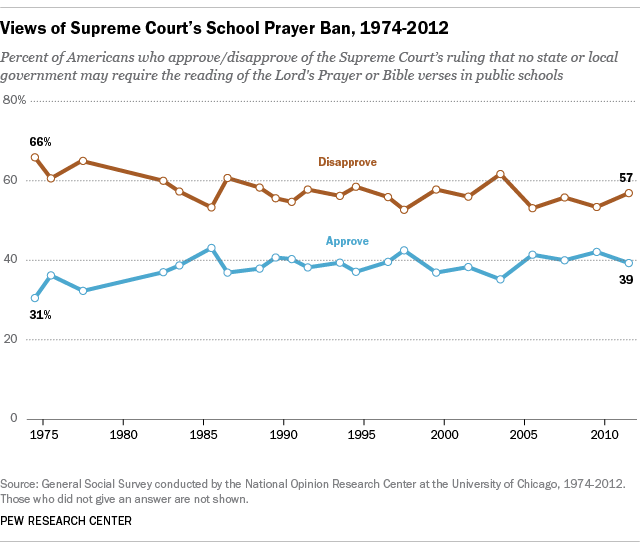 A majority of the Court rejected the school's argument that since the prayer was student initiated and student led, as opposed to officially sponsored by the school, it did not violate the First Amendment. The Court held that this action was school-sponsored prayer because the loudspeakers that the students used for their invocations were owned by the school. 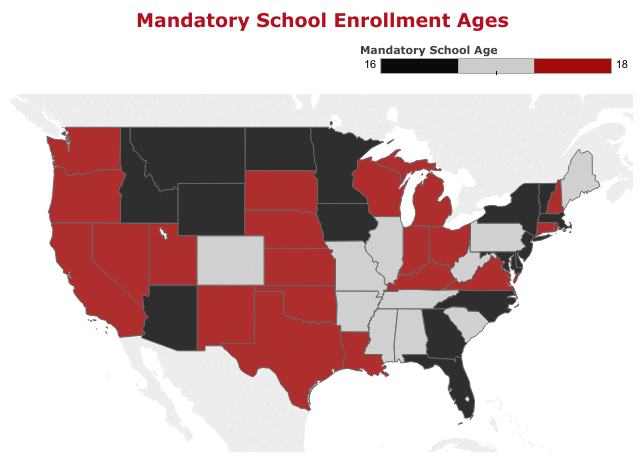 Certain school voucher programs are constitutional. The Ohio Pilot Scholarship Program allowed certain Ohio families to receive tuition aid from the state. This would help offset the cost of tuition at private, including parochial (religiously affiliated) schools. The Supreme Court rejected First Amendment challenges to the program and stated that such aid does not violate the Establishment Clause. Here are some arguments and counterarguments for school prayer. Here is an extensive list of pros and cons of prayer in school. Here are some expert opinions on prayer in school. 7 Reasons We Need Prayer Back in Schools by Genice Phillips on Beliefnet. The truth about school prayer by Charles Haynes, director of the Religious Freedom Education Project at the Newseum. Here's what Americans think about all this. Complete this Prayer in School Team Questionnaire and Discussion. 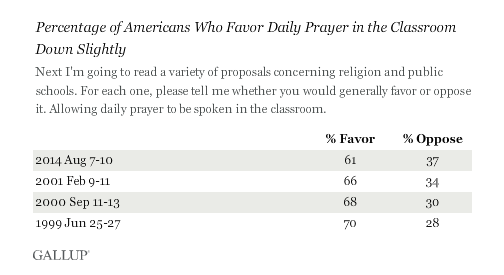 Hey, teacher - this would be a great time to have a freedom of/from religion fishbowl!!! Write an argumentative essay about freedom of religion/freedom from religion. Make something creative out of the case of Engel v. Vitale. Here are your instructions. 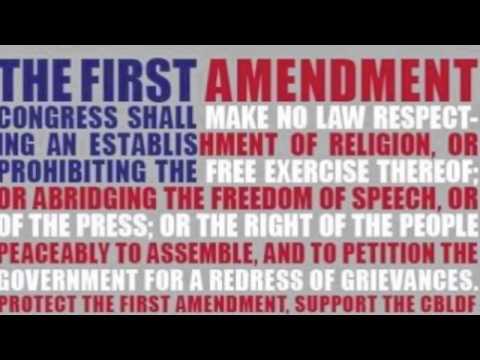 Rewrite the First Amendment (above) as you would like to see it in 2017 America. Edit the First Amendment by cutting, pasting, adding, subtracting, or completely rewriting it. Post your final revision on a poster or paper that you post in a public place or online. Share your post and its responses in class or online. Your opinion again. Now that you've learned about and acted on this issue, share your opinion. Retake our School Prayer Survey! What do you know now that you didn't know before? In the Comment section below, share your final opinion on School Prayer. After the War of 1812, (when was that?) the U.S. government needed additional funds to pay off the debts of the war. At the time, there was no central US national bank, so instead of being able to borrow money from one institution, the government had to work with multiple state banks. How inefficient! As a result, in 1816, Congress set up the Second Bank of the United States with branch offices in multiple locations and convenient horse and buggy drive through service. Many states opposed the National Bank because the state banks then had to compete for business. In response, Maryland passed a law requiring the national bank to pay a heavy tax to the state of Maryland. James McCulloch, the bank's bad-to-the-bone cashier, refused to pay the tax! McCulloch was convicted of failing to pay the tax and was fined $2,500. He appealed the case to the Maryland Court of Appeals, which upheld the decision of the lower court and affirmed McCulloch's conviction. The dispute reached the Supreme Court of the United States. Did Congress have the power to establish a national bank? Did the Maryland law to tax the nationally chartered bank unconstitutionally interfere with federal powers? Do we look fat in these robes? When the Maryland courts upheld this law, the Bank, in the name of its Baltimore branch cashier James W. McCulloch, appealed to the Supreme Court. Who said bank tellers couldn't be famous!?! Daniel Webster, with William Pinkney, argued the case on behalf of the Bank. Luther Martin argued the case on behalf of Maryland. The First Bank of the United States was chartered by Congress for 20 years on February 25, 1791. The concept of the bank was the brainchild of Alexander Hamilton, the first Secretary of the Treasury and a visionary for the great future of America. John Marshall was the chief justice presiding over a landmark case - again! There were seven Supreme Court Justices when the case was decided. The ruling was unanimous, but Justice Thomas Todd did not take part in the ruling. On March 29, 1812, Todd had married Lucy Payne Washington, the youngest sister of Dolley Madison and the widow of Major George Steptoe Washington, who was a nephew of President George Washington. It is believed to be the first wedding held in the White House. Supreme Court Justices do look fat in their robes. "The Congress shall have the Power ... To make all Laws which shall be necessary and proper for carrying into Execution the foregoing Powers and all other Powers vested in this Constitution." The Necessary and Proper Clause is also known as the "Elastic Clause" because its meaning may be stretched to allow Congress to pass a variety of laws. "This Constitution, and the Laws of the United States which shall be made in pursuance thereof ... shall be the supreme Law of the Land; and the Judges in every State shall be bound thereby, any Thing in the Constitution or Laws of any state to the Contrary notwithstanding." This part of the Constitution specifically states that federal laws take priority over state laws. Although the power to charter a national bank is not specifically mentioned in the Constitution, it is one of the implied powers that the Necessary and Proper Clause grants Congress. The bank is a "necessary and proper" way for Congress to conduct the financial affairs of the country. If Maryland is allowed to tax the bank, the state could destroy the bank by taxing it so much that it would have to close. The right of the national government to establish a bank is not specifically granted in the Constitution. It is also not an implied power, so Congress had no right to establish a national bank. The power to establish banks is reserved for the states. States are sovereign (they have complete and permanent authority over themselves), so they have the authority to tax institutions and businesses in their borders. Can be used as a Frisbee in an emergency. The Court unanimously ruled in favor of the national government's right to establish the bank and also found that the state did not have the power to tax the institution. Chief Justice Marshall, writing for the Court, stated that the federal government possessed powers that were not explicitly expressed in the Constitution, known as implied powers. Although the federal government did not specifically have the power to charter a national bank, the national Congress did have the authority to make all laws "necessary and proper" to accomplish other tasks. Marshall also held that even though the states retained the power of taxation, "the constitution and the laws made in pursuance thereof are supreme ... they control the constitution and laws of the respective states, and cannot be controlled by them." Maryland did not have the ability to tax a federal establishment. Taxing the national bank was really an attempt by the state to destroy the bank, and this was a challenge to the federal government's constitutional supremacy. The Court did not rule on pizza, as it had not been invented yet. Imagine life without The Necessary and Proper Clause, where the federal government is limited to only enumerated powers listed in Article I, Section 8 of the US Constitution. Think about how different the government and American life would be. Imagine life without The Supremacy Clause, where much like America under the Articles of Confederation, the federal government is no longer superior to the states. Think about how different the government and American life would be. When there is a conflict between state and federal government, who wins and why? Is the growth of the federal government which McCulloch v Maryland made possible a good thing? If you were John Marshall how would you have ruled in McCulloch v Maryland? How would the U.S. political system be different without McCulloch v Maryland? Create a facebook page for either James McCulloch or John Marshall. Throughout American history there has been a battle between those who fear anarchy and those who fear tyranny. These battles have been fought by Anti-Federalists, and Federalists, Decentralists and Centralists, Republicans and Democrats; and have been fought at the Constitutional Convention, in the Supreme Court, and at the ballot box. And today this fight continues regarding the government's power in the war on terror, state marijuana laws, and immigration enforcement. In terms of this long fought war, think about the trajectory that our country took because of the ruling in McCulloch v Maryland. Would we be better off with a federal government limited to the enumerated powers of the US Constitution; would we be better off with a more robust and powerful federal government; or do we have this balance just right? Contact your member of the U.S. House of Representatives and share your opinion of this fight regarding a current event. How elastic is the Necessary and Proper clause; who wins in a bar fight between the states and the national government; and how does this affect your amazing life?